Over the past few weeks and months, one question has been on the minds of all Star Wars fans; "Where's the trailer?!" The trailer for Star Wars: The Last Jedi, that is. The powers that be at Lucasfilm have been starving us of new footage since they released that amazing teaser at Star Wars Celebration Orlando. Now, it seems we are extremely close to getting a new trailer, and some new evidence has surfaced that goes a long way to to almost confirming it. A few weeks back, Luke Skywalker himself, Mark Hamill, teased on Twitter that a trailer was expected to drop during Monday Night Football on October 9th. This lines up almost perfectly with what happened with The Force Awakens, and while Hamill has since walked back his original claim, all signs have been pointing to it actually happening. 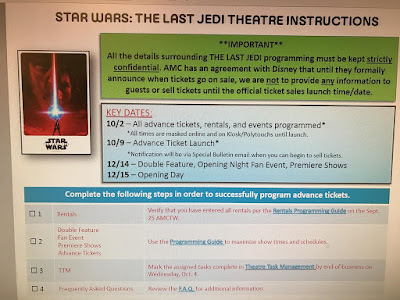 Star Wars News Net spotted a new post on Reddit which shows "instructions" for an AMC Theatre in regards to The Last Jedi. It explains that advance tickets will go on sale starting on October 9th. 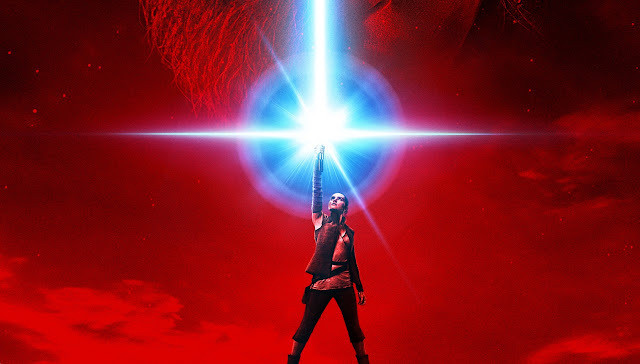 It also makes mention of a "double feature", and other events, perhaps hinting that The Force Awakens will be screened in front of The Last Jedi in certain instances. As it was with Episode VII, it's logical to assume that that a new trailer will be released as part of the announcement that tickets are on sale for The Last Jedi. While Lucasfilm has yet comment on any of these reports, this upcoming Monday almost certainly promises to be an eventful day for Star Wars fans.